GDPR will make gaining and maintaining the right to contact supporters more challenging than ever. This means that face-to-face fundraising should not only be used to drive donations, but also as a valuable way to improve consent from new supporters. 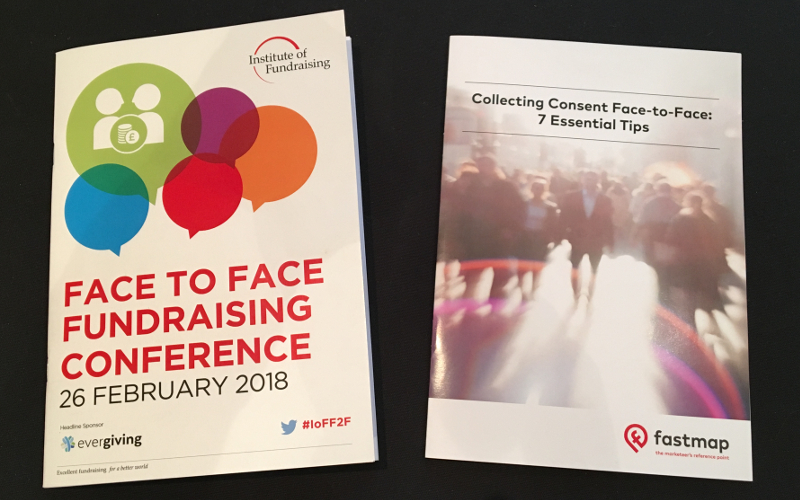 To help charities improve face-to-face consent rates, fastmap has written a new whitepaper: Collecting Consent Face-to-Face: 7 Essential Tips. Launched on Monday during fastmap’s presentation at the IOF’s Face to Face Conference, the whitepaper was created with support and input from the IOF and Home Fundraising. The report explores how charities can effectively target, approach and track their door to door fundraising, street fundraising and other face-to-face campaigns to improve consent rates. For example, the table below is taken from the whitepaper and includes information on how consent rates for different types of face-to-face fundraising compare. The research showed that door to door fundraising campaigns are likely to lead to higher levels of consent than street fundraising campaigns, and that door to door fundraising campaigns receive above average consent rates for contact through SMS and phone. This guide is for door to door fundraisers who want to improve consent through face to face interactions that not only complies with the law and guidelines but is also created in a way that reflects the individual charity’s unique appeal and is seen by supporters as reassuring and compelling. It provides preliminary guidance into incorporating door to door approaches in your consent marketing strategy. Being able to talk to supporters is a privilege not a right. All charities, big and small, should invest some time in understanding how to encourage prospects to consent. This guide is intended as a catalyst, to inspire you to approach consent as a marketing process and not just a legal job. Download the guide: Collecting Consent Face-to-Face: 7 Essential Tips.